Mr. Mittens was born some time during the early summer of 2003 and died on Wednesday, August 11, 2010. He was one of the great cats. He joined the household in 2004 after falling in love with our Gracie. He just moved right in, to the annoyance of the woman who owned him. He was a very big boy, with a head the size of a softball and weighing 27 pounds, but he was all love, unless you were a bird in the yard. Bird catching was his favorite hobby. Mr. Mittens was such a sweetheart. Always good humored, even when our Gracie would block him from coming in the house. Having been raised with dogs, it was no surprise that when I brought home our Lucy a few weeks ago, he made her feel right at home. We are all very sad that he is gone. Japanese Cat: You are doing it right! Who does this cat remind you of? 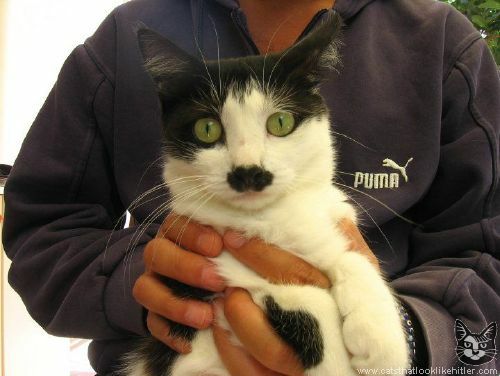 You can go here to see more kittehs who bear a passing resemblance to one of the world’s most hated war criminals.